Doc Rivers, KG, Pierce, Welker, Vinatieri, Ray Allen, Seguin: Which Former Boston Players Should Be Booed? I don’t know how anyone could watch the Doc Rivers post game press conference tonight and not get teary-eyed watching Doc get teary-eyed. The Boston Celtics coach for the last nine seasons made his triumphant return to the Garden tonight, in his first visit to Boston as the coach of the Los Angeles Clippers. All day on the radio I had to listen to local goons Mike Felger and Tony Massarotti take calls from a bunch of guys who may as well all be named Sully from Framingham, and listen to them debate whether or not Doc should be booed or cheered tonight. How is this even a question that’s open for debate? It’s the most asinine thing I’ve heard in a while. Yea, you’re gonna boo some players who deserve it. That doesn’t mean you have to boo everyone who wasn’t Larry Bird, and had the audacity to finish their career in a place other than the sacred confines of Boston. 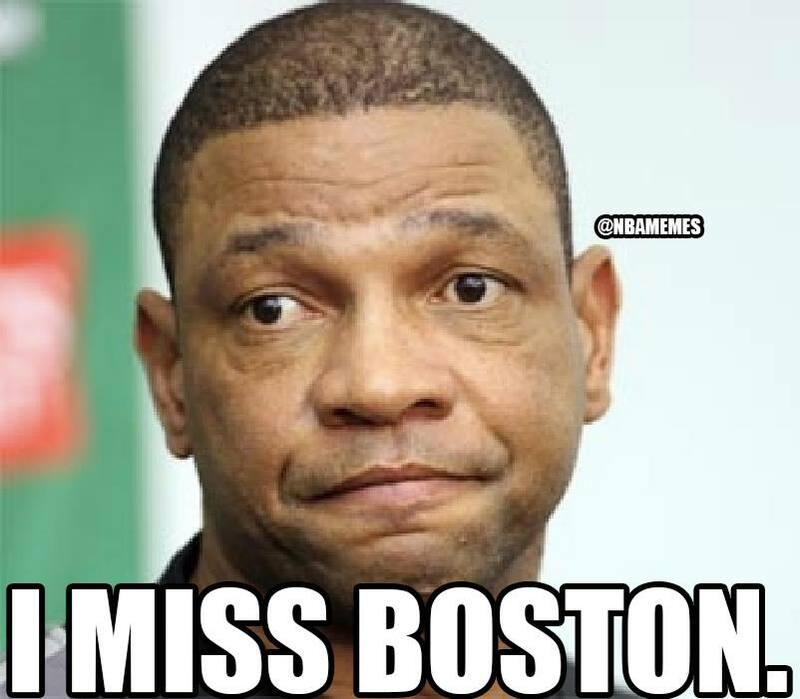 Doc Rivers: Obviously not. Biggest no brainer. Anyone who booed Doc tonight should get a giant lump of coal for christmas. Stop embarrassing actual fans. You shame your family, your friends, and the entire state of Massachusetts. Doc gave us nine awesome years here. He was terrible at first and Bill Simmons unsuccessfully tried to drive him out of town. Then he kind of hit the jackpot when Danny Ainge just threw KG and Ray Allen in his lap, and won us our 17th banner. Could he have won a title without KG and Allen? Hell no. But it doesn’t change the fact that he did it, and he nearly won a second two years later. While he was coach of the Celtics he was nothing but respectful, friendly, and open. Bill Belichick is none of these things. Are we gonna boo him when he leaves? Or do we just boo friendly people? Doc saw the end was near, and he had no choice but to go. He’s a great coach, and should be coaching a great team – not rebuilding in Boston. The Celtics got another great coach to replace him for half the price (Brad Stevens), and a first round draft pick out of it. Doc gets to coach a contending team. Seems to me like everyone’s a winner. So stifle your nan-tang if you can’t cheer for him. 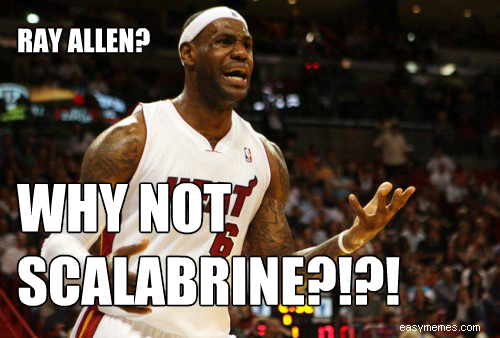 Ray Allen: This one’s debatable. I can see why people don’t think he should be booed. He played a pivotal role as the third wheel in the Big 3. He’s the greatest three point shooter ever, and he won a title for the Celtics. But at the same time, he went to the Miami Heat. That in and of itself is just a giant dooshnozzle move. Going to the LA Clippers is one thing. They are what they are. The Heat though? They have to be top five most hateable franchises in the history of sports. Everything about the Heat’s existence is forsaken by God. The fact that he went there for less money too, and then singlehandedly won the a Championship by saving their asses in Game 6 makes him all the more dislikable. I say boo Ray Ray, but it’s a toss up. KG and Paul Pierce: I stand corrected – this is the biggest no brainer. Anyone who dares to boo either of these guys should be treated like a political dissident in North Korea. Mock trials and summary executions. 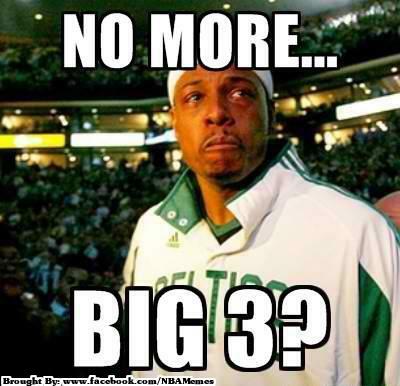 You know it hurts Pierce inside to not be a Celtic right now, and he’s recently stated that he wants to retire as a Celtic. He LOVES Boston. KG agreed to come here in an era when NBA stars only wanna go to somewhere Drake made a rap video – Miami, New York, Brooklyn, Los Angeles, etc. He defied conventional wisdom from his profession, and he was by far the biggest reason we won in 2008, and then lost in 2009 (because he was hurt). They were good until the last drop, and they left because they were traded. I seriously doubt anyone plans on booing these two in Boston, but if they do then please do society a favor and throw them down the nearest well. Jacoby Ellsbury: How do you not boo this chump? I wanted to boo him when he actually was on the Red Sox. Hes your classic fancy boy. Needs every other day off. Playing for the contract. And he’s a pink hat favorite. There is absolutely nothing to like about this guy and everyone should bio him. Well at least the Yankees are stuck with him now. Have fun paying his salary at age 36. Suckers. Tyler Seguin: This is another toss up. The other guys listed above were every bit as good as advertised. 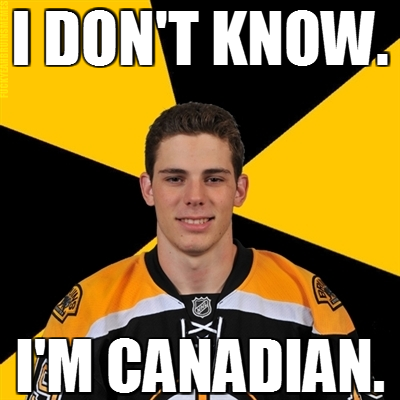 Seguin meanwhile was kind of a disappointment. I still say they gave up on him too quickly, but the fact of the matter is that he should’ve been better. I’ll never forget when he first came into the league. I pooped my pants with pleasure when he had that two goal game in his first playoff game. That’s about it though. After that it was mainly just inconstancy and underage debauchery that always seemed to end up on social media. Now he’s gonna score 40 goals a year in Dallas and people are gonna be pissed off at him for not doing the same in a Bruins uniform. I don’t blame him for getting run out of town though. He’s a 21 year old kid with way too much money. If I had that kind of dough at his age it would’ve been a deadly combination. I got into enough shenanigans with three bucks and a twelve pack of Keystone Light. So when he comes to town I say neither boo nor cheer. He means very little to me in the long run. Let him become a 40 goal scorer for a team that perpetually goes nowhere and move on with your lives people. Adam Vinatieri: The fact that this guy still gets booed makes me sick to my stomach. He’s only the most legendary kicker in the history of the world. People forget that the Tuck Rule didn’t win us the Oakland Raiders game – Vinatieri’s kick in the snow did. Then the next week there were 40 mph winds in Pittsburgh, and he nailed every kick. Then he won us the Super Bowl in 2001, and did it against two years later. At the end of the day Bob Kraft didn’t wanna pay him because he’s a cheapskate miser who will save a buck anyway he can so that he can buy his trophy rebound babe another pearl necklace. Yea, so he went to the Colts. God forbid a kicker wants to kick in a dome. God forbid he goes somewhere where ownership respects him and compensates him for his services. There’s plenty of room for you at the bottom of the well if you insist on booing this guy. 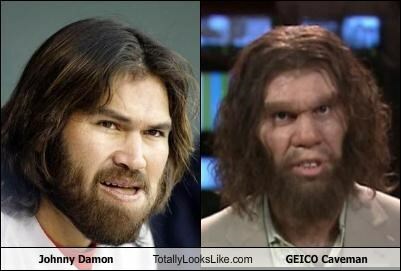 Johnny Damon: Probably one of the easiest to boo all time. I don’t hate him for going to the Yankees. I just hated how he brought the Sweey Caroline folks out. 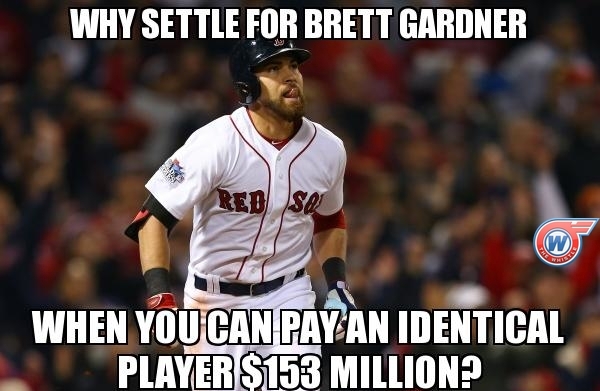 He’s basically the reason you have to take out a mortgage to go to Fenway. So don’t boo him because he skipped town for more money. How quickly we forget that we pried him away from oakland – a franchise that seems to be perpetually broke. No you should hate him because his stupid Jesus look brought out the pink hats. Bill Parcells: This is a tough one for some people but for me it’s easy. The man made football relevant in New England and I bless his soul for that. I if you didn’t realize he was a rental résumé builder then you should probably go back to watching the Kardasians. Yea he went to the Jets. Dude is from Jersey, did you expect some kind of loyalty out of him? News flash: Professionals don’t love your team like you do. They’re hired help and nothing more. I definitely cheer for this guy. 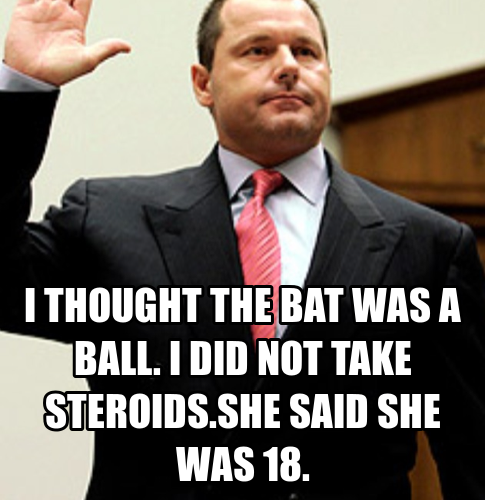 Roger Clemens: Some people actually wanna cheer for this clown. That boggles my mind. No former player should be booed louder than him. He was good in the 80’s ans his career was basically ending when he left Boston. Then he has the best years of his career in Toronto and New York, wins a bunch of World Series and Cy Youngs, juices his fave off and then lies to congress. He offends me as both a Red Sox fan and a taxpayer. If you cheer for him then you are fraud city. Wes Welker: I kind of want to boo Welker, but I just can’t. 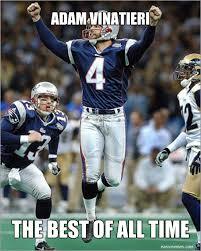 I’m still pissed at him, not because he went to the Denver Broncos, but because he cost us possibly two Super Bowls. How did he drop those passes? Other than that I have no beef with the guy. He took an absolute pounding and got up every single time. That’s more than I can say for the hobbled rag tag receivers the Patriots have been throwing out there this year. 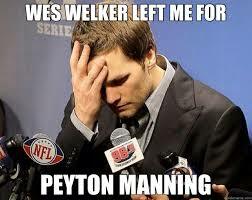 The Pats had plenty of cap space to sign Welker, and he barely took more money to go to Denver. Personally if I was him I would’ve gone to Indianapolis. Play on turf, you’re the man there, and you get to play with Andrew Luck. But I’m not as mad about him going to Denver as Sully from Framingham. He obviously wasn’t wanted here so he moved on with his life. What do these nudniks around here expect him to do? Grovel? Grow up Massholes. So what do you think? 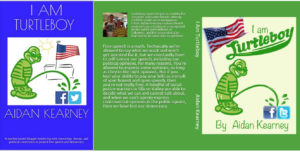 Feel free to share your thoughts to keep the conversation going. fսгther popst tyank you once again. Hi there, I think your website could possibly be having web browser compatibility problems. written by him as no one else realize such special approximately my trouble. Welker, Vinatieri, Ray Allen, Seguin: Which Former Boston Players Should Be Booed?